Princeton University Campus Expeditions is a program that provides early college exposure and introduces middle school students to the college environment. Goals of the program are to inspire early awareness of education beyond high school, share the lifestyle at Princeton University and support the school’s classroom learning initiatives while visiting Princeton University. It is a motivational program that was developed to inspire students to start thinking early about attending college by connecting with Princeton University students who lead them through their expedition experience. Motivation via early exposure to the college environment makes the reality of attending college a possibility worth seeking. 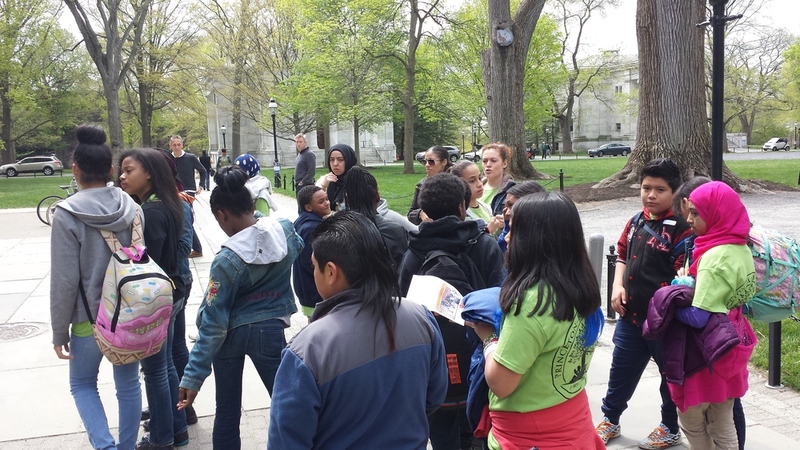 The Princeton-Blairstown Center offers it's School-Based Program partners - Global Neighborhood Secondary School (GNSS) and Rivera Middle School in Trenton - the opportunity to bring students for a guided tour of the Princeton University Campus and have University students speak directly with current students. This year, University students from Colonial Club served as tour guides and answered questions about academic and student life. For more information on Campus Expeditions please contact Pam Gregory at pgregory@princetonblairstown.org.